The Met Office has told the public to expect snow and ice today (Thursday) and tomorrow as temperatures drop. 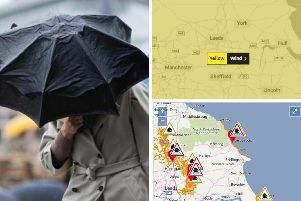 The yellow “be aware” weather warning has been issued and is valid from 3pm today to 11am tomorrow. A Met Office spokesperson said: “Showers during Thursday afternoon and evening are expected to fall increasingly as sleet, snow and hail. “This may settle in places, especially from late afternoon and more especially on high ground. “In addition, a more persistent spell of rain, sleet and snow may affect the west and south of the yellow area during the early hours of Friday morning. The spokesperson warned the public to be aware of the risk of some travel disruption and difficult driving conditions.